Summer took its sweet time arriving in Switzerland this year. 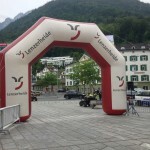 However, on June 16th the mountain running calendar got started with the LGT Marathon in Liechtenstein with the best weather conditions. 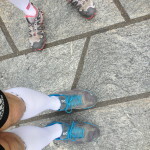 Despite a beautiful start to the season the weather turned again and by the Graubünden Marathon on June 29th, winter had returned. 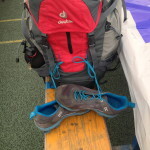 Great planning is important for any marathon and the organizers behind the 11th Graubünden Marathon showed their abilities to take on the weather’s challenge. 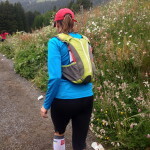 Having cleared the path up to the Rothorn (2865 meters) for the race well in advance, the OC was optimistic that they would be welcoming those finishing the Marathon, 1/2 Marathon and Rothorn Rennen at the summit. Unfortunately the weather turned on the Wednesday before and dumped another 1.5 meters of snow up on this popular mountain, forcing the OC to make a few changes. With careful planning they were able to save the race by shortening it by 2KM and some 500 meters, which while disappointing to the most hardened of runners, was quite welcome to those expecting better conditions. 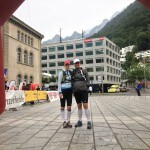 Arriving in Chur early Saturday morning, we collected our numbers along with a handful of other runners. There were less than 400 people participating in the full marathon, now shortened to 40KM. The shy dark, but holding back the rain as best it could when the starting shot was fired and we hustled down Chur’s medieval cobblestone streets and out into a narrow valley. The climb starts early but leads into the forest past small farms. The leafy cover of the trees protects runners from the rain, and in other years from the sun. For every hundred or so meters you noticed a slight drop in temperature. 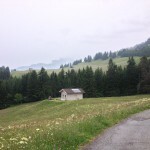 Coming over the first major ascent into Lenzerheide and running on a paved farm road between colourful, though faded alpine pastures we noticed how cold and wet it was as the rain started to come down harder than just a light drizzle. Having just climbed some 700 meters running with my Ons on the paved road gave me a nice stretch to win back some time and recover energy. 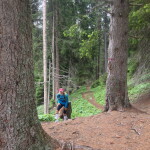 A short upward stretch through a coniferous forest brings the element of trail running back into the picture as we’re forced to negotiate tangles roots along the path that have also been made very slippery. The secret to making one’s way through this obstacle course begging for an ankle roll is to run almost on your toes. Getting out of the forest we make our way around the Heidesee and then veer off to gain distance and elevation on the changed route. The changed route was well planned. It fit seamlessly into the route with the stretch taking us up a hill on the other side of the valley from the Rothorn and doing the Panoramaweg over Spoina. Up through the woods and around alpine roads, you almost gets lost as the winding path, thick fog, trees and hills scramble your orientation. 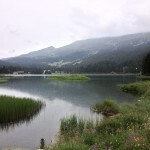 Your inner GPS is quickly adjusted again when you see the signs for Lenzerheide (55 Minuten) and you head back towards Heidsee, where you’ll run the second half around and then head towards Lenzerheide. 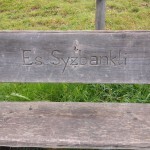 Again there is some forested path with stones and roots to transverse and then a loop around the sport complex where people cheer you on and your name is called out as a speaker tells you that there are only 5 kilometers to go. If you’ve run the race before, or have checked out the elevation profile you know that these are the hardest 5 kilometers of the route. 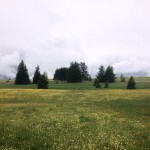 From Lenzerheide you hit the Rothorn straight on. A hiking path cuts straight up through a meadow and disappears into a forest where the path has tight switchbacks. A powerful and large stride here is better than many fast small steps, which with the thinning air just make you tired. In the woods you’ll hear traditional music being played on an accordion — both times I’ve run this race he’s been there, so I imagine he’ll be there in 2014 as well. After climbing some 400 meters in about 1 kilometer you’re greeted by a refreshment stand and friendly marathon staff making sure that you safely pass through a labyrinth of boulders. From here the trail running begins again. There is an almost 2 kilometer stretch with little climb along the ledge of the mountain. 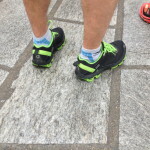 At points the path is narrow and concentration and nimble footwork are needed if you want to safely and quickly make it through here — but it’s fun and that’s what trail running is about. Getting out of the woods a small climb welcomes you as you enter a pasture from where you can hear the finish line at Scharmoin. When the marathon runs on its regular course this would be the last major landmark before the final ascent up to the Rothorn. On this day though, it is the finish at 40km and dreary 5 degrees. 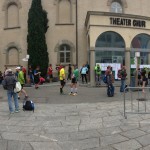 The runners of the 2013 Graubünden Marathon ran one of the last winter marathons of the 2012-2013 season. The day was cold and wet, but then real trail runners don’t fuss about the weather, they take it as it comes and the worse it is the better the stories are when you look back at it. 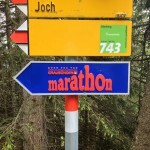 With its regular 2682 meters of climb in 42 km the Graubünden Marathon is the steepest and challenging marathon in Europe. Runners looking to test their hill running abilities will greatly enjoy this race. 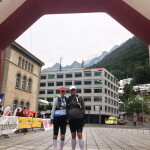 This entry was posted in Chur, Graubünden, Graubünden Marathon, Parpaner Rothorn, Race Report, Switzerland, Uncategorized and tagged Chur, Graubünden, Graubünden Marathon, Hardest Marathon in Europe, Lenzerheide, Most elevation in a marathon, mountain running, Rothorn, Trail Running by Christian Langenegger. Bookmark the permalink.